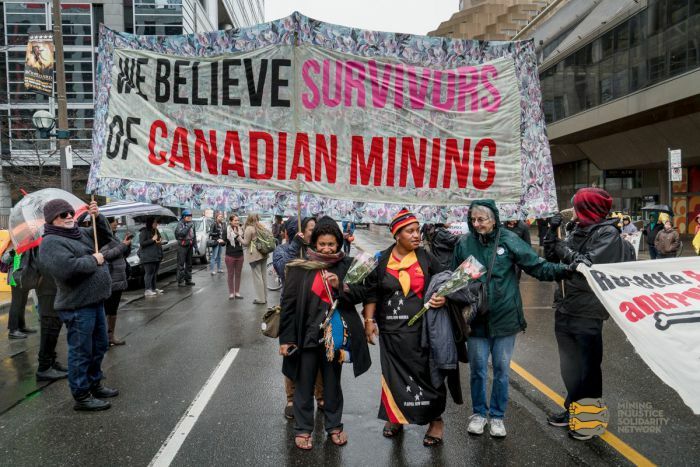 Indigenous women from Papua New Guinea called on Canadian mining companies to halt violence and provide equitable remedy. In February, we accompanied José Luis Abarca, the son of murdered Mexican community leader Mariano Abarca, and other supporters to file a complaint with the Public Sector Integrity Commission (PSIC) calling for an investigation into the Canadian Embassy in Mexico and its support for Canadian mining company Blackfire Exploration’s operation in Chiapas. The complaint was based on information obtained through an Access to Information request, which demonstrated that Canadian Embassy support was essential to putting the Blackfire barite mine into operation and that the Embassy later sought to lobby Chiapas state officials to quell protests over environmental and social impacts of Blackfire’s operations, in which Abarca played a leading role. Although the mine was eventually closed on environmental grounds shortly after Abarca was murdered, the documents show that the Embassy continued to provide support, including advising Blackfire how it could sue Mexico under NAFTA. In April, we received notice that the Commissioner was refusing to investigate the complaint. In response, we supported the complainants in filing for judicial review with the Federal Court of Canada, arguing that the decision of the Commissioner is based on a narrow interpretation of his mandate, as well as an erroneous and poorly argued conclusion that there were no policies that the Embassy should have been following other than to lobby on Blackfire’s behalf. We will continue to collaborate with Mexican partners and Canadian human rights lawyers to seek justice for Mariano Abarca and to ensure that Canada’s ‘economic diplomacy’ does not come at the cost of the wellbeing and safety of those protecting their lands and communities from harm by Canadian mining operations. From April 27 to 30, MiningWatch’s partners joined women from Canada and the Global South to participate in the International Gathering of Women Resisting Extractivism in Montreal. This gathering brought together more than 40 land and life defenders from around the world to share their experiences and strategies of resistance, as well as to speak out against the threats they are facing because of their work. MiningWatch brought in women from Papua New Guinea, Tanzania, and South Africa. One was Cressida Kuala, who founded and leads the Porgera Red Wara (Water) Women’s Association in Papua New Guinea. Her organization documents and advocates for the rights of women affected by Barrick Gold’s Porgera Joint Venture Mine, including women who have suffered sexual violence at the hands of mine security. While in Canada, Cressida also attended Barrick’s AGM in Toronto demanding that the company do more to halt violence at the mine, and ensure equitable remedy for all victims of mine-related human rights abuses. Cressida expressed that many women are deeply dissatisfied with the remedy Barrick has provided, and many more women who have been raped by mine security and police guarding the mine have not yet received any remedy. For many years MiningWatch has been critical of Barrick’s grievance mechanisms for failing to provide fair reparations for those the mines have harmed. In January, Barrick subsidiary Acacia Mining released a new operating procedure for the grievance mechanism at its North Mara mine in Tanzania. We reviewed the new grievance procedure and found it to lack independence and not to afford the mostly indigent and illiterate victims of the North Mara mine a fair process to have their complaints addressed. Human rights abuses at Canadian-owned mining sites around the world are widespread and well-documented. Victims of such abuse often have nowhere to turn to seek justice. Since 2005, MiningWatch, together with other members of the Canadian Network on Corporate Accountability – with the support of tens and hundreds of thousands of Canadians over the years – has fought for an oversight body that will allow people from around the world who have been harmed by the activities of our mining companies to come to Canada to file a complaint. After more than a decade of work, in January, Canada’s International Trade Minister finally announced the creation of a “Canadian Ombudsperson for Responsible Enterprise” to investigate human rights complaints about the overseas operations of Canadian mining companies and recommend remedy for harm done. The ombuds’ recommendations may include the withdrawal of Canadian government political and financial support to a company, as well as advice to the Government of Canada on policy and legislative changes needed to further address mining-related harms. The ombuds will operate at arm’s length from government and will have the power to compel documents and witnesses. To ensure the office is effective, we will continue to press to ensure that the ombudsperson is given the powers and resources needed to conduct thorough investigations. It is time that those who have been harmed by Canadian mining operations overseas have access to justice in Canada. In February, the federal government tabled Bill C-69, which introduces a proposed new Impact Assessment Act (IAA). Bill C-69 follows more than 18 months of consultation and discussion of Canada’s environmental assessment processes, and is claimed to fulfill the government’s commitment to introduce new, fair processes to ensure decisions are based on science and Indigenous knowledge, and to win back public trust. There are a number of aspects of Bill C-69 that are laudable in their purpose, but fall short in their implementation. These include gender-based analysis, the treatment of knowledge and evidence, complete and open information registries, the use of strategic and regional assessments and an emphasis on cumulative effects. The high-profile change to “impact assessment” will certainly help bring decisions affecting economic and social impacts into public scrutiny, but again, the specifics are lacking. There are also a number of clear failures. Other essential elements are missing entirely, such as recognition of Indigenous authority, implementation of the United Nations Declaration of the Rights of Indigenous Peoples (UNDRIP), and effective linkage between regional/strategic assessments and project assessments. C-69 also fails to include smaller projects, and it will leave the Minister and Cabinet without very clear direction, criteria, and accountability for decision-making. In a nutshell, C-69’s top-line principles and commitments are laudable, but their execution falls short. The Bill will be reviewed by the Senate in the fall, and even if it gets further amendments, we will have a lot of work to do on new regulations and guidelines under C-69 to try to make significant improvements.